At $30 per adult, the four-course menu to be offered at Casona's special gluten-free dining event on March 11 provides a relatively inexpensive way to sample excellent Cuban and Latin cuisine, including my favorite entrée there - the citrus-marinated pork. Kids are welcome too - there's a special menu for the younger set. There'll be door prizes from Shabtai Gourmet and it's a great opportunity to meet other gluten-free diners from throughout the region. Be sure to make your reservations soon! This week's addition to the ever-growing list of area gluten-free-friendly restaurants is from Delaware. Stanley's Tavern in Wilmington (2038 Foulk Road, 302-475-1887) has a gluten-free menu that includes ribs. The Philadelphia Inquirer's Michael Klein reported this week that Five Guys Burgers and Fries, with gluten-free bunless burgers and fries, plans an April opening for another Center City Philadelphia location, this one at 1109 Walnut St. The chain also has an outlet coming this spring to the Exton Square Mall, according to Meal Ticket. Katie Cavuto, who was a finalist in last year's Next Food Network Star competition, today cuts the ribbon at Healthy Bites To Go in South Philadelphia (2521 Christian Street, 215-259-8646). Among the gluten-free products she'll be carrying are baking mixes from Purely Elizabeth and veggie burgers from Asherah's Gourmet. 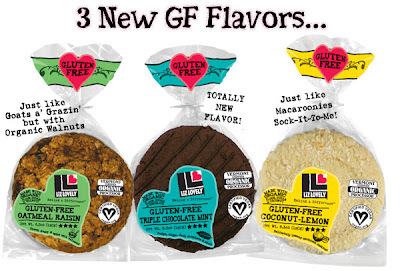 Vegan cookie company Liz Lovely has unveiled three new gluten-free varieties: Oatmeal Raisin, Triple Chocolate Mint and Coconut-Lemon. Liz's cookies are available at many outlets in Philadelphia and its environs. Glutino will be introducing three new gluten-free rice cereals. The regular flakes, flakes with berries and frosted flake varieties will be fortified with vitamins A, C and E, iron and other nutrients. There are still openings at Camp Celiac in Rhode Island. The 2010 edition will run from August 8-13 at Camp Aldersgate in North Scituate, just outside of Providence. My older son wrote about the great time he had there last year. Another series of gluten-free cooking classes is coming to the Rancocas Valley Regional High School Education Program in Mount Holly beginning on February 22. Don't be shy about dropping me a line with any gluten-free news I can share in a future post. Have a great weekend!